Rachel Alexandra has been retired and her 2010 season was far short of expectations set by her connections and racing fans. This year started off with the prospect of a showdown with Zenyatta that looked like a lock until March 13th when Rachel Alexandra was bested by Zardana, a stablemate of Zenyatta. From that point on her season was about getting her back to the 2009 form that netted her Horse of the Year honors and not about a race against her chief rival. Rachel Alexandra's struggles at the track this year are not about who was truly worthy of Horse of the Year honors from the previous year, but about the tough task of defending a championship. Gio Ponti can be seen as another example of the demands of defending a championship, after winning the Eclipse honors for best older colt and best male turf horse he was sent back into training with the immediate goal of the Dubai World Cup and the long term goal of returning to the Breeders Cup. Gio Ponti's 2010 debut was at Tampa Bay Downs on February 20th in a listed stakes that was meant as a warm up race for the World Cup, he lost that race to Karelian who went on to capture the grade one Maker's Mark Mile. His race in the Dubai World Cup was a close fourth place finish, followed by a narrow loss to long shot stablemate Winchester in the Manhattan. He returned to the winner's circle in the Man O' War where he barely defeated 50-1 long shot Mission Approved and his last start was a narrow loss in the Arlington Million, a race he won last year. In five starts since his 2009 championship season and he has only one victory. Forever Together won the 2008 Breeders Cup Filly and Mare Turf en route to end of the year honors as the best turf female. She is on a seven race losing streak with her last win being the Diana Handicap on August 1, 2009. Her record is ten starts with two wins since clinching the 2008 Eclipse honors. Street Sense turned in dominant performances in the Breeders Cup Juvenile and Kentucky Derby against the likes of Curlin and Hard Spun. Curlin improved from his Derby outing against the champ to win the Preakness in a photo and from that point on Street Sense was never the same. He was all out to win the Jim Dandy and Travers before going down in defeat in his last two starts to the same three year olds he whipped in the Derby. Zenyatta is a freak of nature, she successfully defended her Older Female award last year and is four for four this year with all of the wins being in grade one races. There have been different tactics that have been unsuccessfully used in trying to defeat Zenyatta boxing her in, floating her wide, and going extremely slow up front all come to mind. What she has accomplished in her last three years starts looking better and better when compared to how others have fared. There always have been questions about the quality of the competition she has faced, but the important factor is she has turned them all back so far. Being a defending champion is a tough task to take on, there is new competition to take on and horses age differently. A championship campaign means that is when a horse was at their peak at the time of the honors. Duplicating those type of performances a year later with new variables is a challenge that is among one of tougher feats to accomplish in this sport. Attendance or lack of it is an issue that is brought up every once in a while when mentioning the Belmont and Aqueduct meet. It will probably be written about again by Bossert or Fountaine sometime next week after the Jockey Club Gold Cup and about 10,000 fans show up to see this high caliber event. After Belmont's opening weekend the NY Daily News' Jerry Bossert mentioned that about 8,000 fans showed up for opening day and 50,000 showed up for the final Sunday at Saratoga, which was a give away day. He bemoaned the fact that there was a lack of people showing up at Belmont compared to an inflated figure from one day at Saratoga. Using Saratoga's attendance figures as a measuring stick is fair, using a figure from a day they were giving something away is absurd. People show up in droves to with shopping carts to buy up whatever NYRA is giving out and leave before the first race starts, it is a nonsense figure. The other point is that Saratoga is upstate and there is less to do up there than downstate, also their meet has a majority of their dates in August and that is a big vacation month so of course there will be more interest in that meet from the weekend warriors and others who can't show up on a daily basis. Attendance as a measure of how racing is doing is an archaic way of measuring the health of racing, overall handle is a better way to determine how business is going. There are more ways to legally place a bet now than thirty years ago, back in the early 80's in New York City the only two ways to place a bet were get out to the track or go to a brick and mortar OTB location. Now you have phone accounts and Internet wagering to accompany to the brick and mortar locations. Other than the regular daily crowd, people can't make it out to the track because they have work. Speaking from personal experience, getting out to Belmont and Aqueduct during the weekend by mass transit or car is not a fun experience. It used to be easier to get out to Belmont until the LIRR canceled service to that branch, now you have to take the F train to the last stop (179th st Jamaica) and wait for the Q2 or an overcrowded N6. Aqueduct has two wonderful options to get out there, take the correct A train (there are two of them) through Brooklyn on the weekend when service is drastically cut back or wait at a bus stop in the middle of the winter for upwards of thirty minutes. Getting out to Aqueduct by car is not a good alternative to the MTA either, being near JFK airport makes the traffic worse than it should be and the Interboro Expressway is a traffic jammed nightmare that links up to the pothole laden Van Wyck Expressway. Belmont has the Cross Island Parkway, which is a trafic tangled nightmare after the last race. Saratoga posted a decline this year and the NYRA executives were happy because they didn't lose as much as they thought they would. When one loses money it is not something to gloat about, you don't see someone leave a casino table game after losing with a smile on their face very often and if they do it probably is due to the fact they are inebriated. Saratoga used to be a meet that showcased the best of racing, in recent years due to added dates the meet has resembled Belmont or Aqueduct north. They had more maiden claiming and basement level claiming races during this meet than any other Saratoga meet in recent years. When you give the public bad races this is what you get, Aqueduct usually is last out of three with daily average handle because of this. 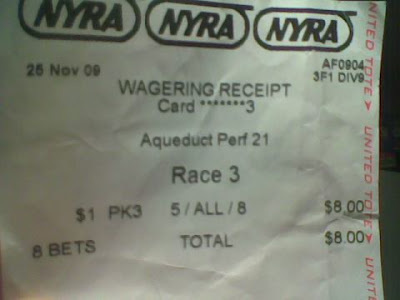 If NYRA really wanted to improve attendance they would be aggressive and promote how they have the cheapest attendance out of all professional sports teams in the area. I'm pretty sure the New York Racing Association has not run an ad on network television since 1998, I have it on tape somewhere. Millions upon millions are bet into New York racing every week even though the cumulative total of people showing at Belmont is somewhere in the 20,000 region. Complaints about people not showing up to the plant are minor in comparison to the fact that a decline in handle is a much more significant sign. Belmont’s fall meet is well under way and this meet going under the nomenclature of the fall championship meet is clearly false advertising. The stakes program that once was the envy of every other racing secretary in the nation has been savaged by overly cautious trainers, stakes races being moved to different dates, and competition from other racetracks. The Breeders Cup has been a double edged sword for the national racing scene, it has given racing a “Super Bowl” style event to show off the sport’s stars. On the other end it has changed how trainers manage their horses during the course of the year. Case in point would be the 1996 season of Skip Away where after competing in all of the triple crown races he ran in the Ohio Derby, Haskell, Travers, Woodbine Million, and the Jockey Club Gold Cup. Last year after Summer Bird ran in two of the triple crown races he ran in the Haskell, Travers, and Jockey Club Gold Cup with the ultimate goal being a start in the Breeders Cup Classic. The lighter schedule high caliber horses are on is due to trainers making decisions based on speed figures and avoiding a bounce race. This trend is most prevalent with the juveniles, Pletcher’s top two year old Uncle Mo won by open lengths in his debut and the Champagne is his next start. If he wins that race and the Breeders Cup Juvenile to go three for three there is no denying him the juvenile eclipse honors. When Favorite Trick won his Horse of Year and Juvenile eclipse award in 1997 he was undefeated in eight starts with victories at four different racetracks. Opening weekend at Belmont used to have a solid lineup of high class stakes action, this year featured second string older turf runners on Saturday and New York bred turf routers on Sunday. Back in 2004, only seven years ago the Woodward, Gazelle, Man O’ War, and Ruffian were on the opening weekend card. Saratoga now hosts the Woodward and Ruffian, the Gazelle is now on Thanksgiving weekend at Aqueduct, and the Man O’ War is now in July. The Forest Hills Handicap, which is a race that Artax and Delaware Township won is no longer on the schedule. The Cowdin is not on the schedule either, Coronado’s Quest and Easy Goer were prominent winners of this race. NY racing is facing tough competition from Philadelphia Park, the Pennsylvania Derby with a million dollar purse is now a week before the Jockey Club Gold Cup. This gives the trainer of a good three year old a chance at a good purse and extra rest before the Breeders Cup. I would say this race also drains from the Jerome, but that is not on the schedule this year. Recent history of the Beldame has been that it features small fields and short priced winners, the Cotillion stakes has been siphoning off of this race for years. Back in 2004 Ashado won the Cotillion before going on to victory in the Distaff and last year Careless Jewel passed up on a meeting with Music Note for the Cotillion. The fall meeting at Belmont was once considered on par with the Saratoga, in the last two years it has taken a step backwards in terms of quality. Looking at the above reasons it is not hard to see why. Maybe with the green lighting of the Aqueduct VLTs a few days ago the racing quality will improve thanks to an increased purse structure. Until then, what you see is what you get. 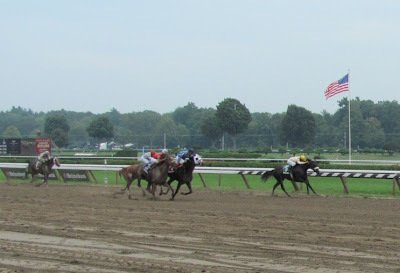 There were two stakes races on the books yesterday, the Saratoga Dew for older fillies and mares foaled in the state of New York and the grade three With Anticipation for two year old colts and geldings. The With Anticipation has served as a stepping stone to the Breeders Cup Juvenile Turf since its inception back in 2007. Wicked Diva took early command and never relenquished the lead, at two or three points in the stretch run it looked like she was going to get passed though. The horses that finished behind her, Bankers Buy and Don't Forget Gil had every opportunity to win and they did not capitalize on it. Maidens seem to do well in the With Anticipation, Soldat made his turf debut a successful one. He won by three lengths over the 2/1 favorite Powhatan County who made a belated run with an 1/8 of a mile left to get up for second. Sensational Slam was never a factor after stalking the early pace and going backwards as soon as the real running started. Closing Weekend at the Spa and the usual stakes are on tap around the country with the exception of the Pennsylvania Derby, which has been moved to the end of September and will probably act as a feeder for the Breeders Cup Classic. Philadelphia Park (there is no way I am calling that track Parx) replaced the Pennsylvania Derby with a lucrative prep for said event called the Smarty Jones. On my count that is two races named in honor the Kentucky Derby winner, Oaklawn has a stakes named the Smarty Jones as well. On Saturday at Saratoga a horse of legendary status is set to start his march towards greatness, that horse is Mr. Fantasy. The impressive winner of the Withers that Greg posted about a few times last year is looking to get his year back on track after two straight tough beats. The race that Mr. Fantasy is entered in is race three and it shapes up like a good listed stakes race featuring Brother Bird (half to Mine That Bird) and Safe Trip who was last seen chasing Discreetly Mine. This race is certainly one to watch out for and probably will be a productive next out race. The Forego came up a full field with lots of viable contenders, Bribon turned in two straight good efforts going six furlongs and seems to show no signs of slowing down. Vineyard Haven has been a model of consistency at this track with two wins and two placings out of four starts. Big Drama is back to what he does best and that is sprinting, seven furlongs is no issue either with two wins at the distance. Warrior's Reward is another one who relishes the 7/8 of a mile trip with wins in three out of five tries. If anything, this race is wide open with a few solid opportunities to make a good score. The Woodward has had recent history being a playground for the heavy chalk. In the last three years champion runners Lawyer Ron, Curlin, and Rachel Alexandra won with heavy public support. This year the morning line favorite is Quality Road who is listed at 1/4, when a morning line odds maker is setting the odds that low it usually means that they don't too high of an opinion on the rest of the field. The morning line odds maker has enough trouble listing a horse at 50/1 and seeing the extreme from either end of the spectrum is rare. The rest of the weekend at Saratoga has two grade three turf stakes, the Hopeful, and the Spinaway. Might as well lump these four stakes together, because the juvenile picture is almost always murky no matter what the experts say and Greg has a better idea of turf racing than yours truly. As far as the the Hopeful and Spinaway being an effective barometer for the future of the juvenile division it has a bad recent record, especially the Spinaway. Hot Dixie Chick has not been the same this year, Irish Smoke never ran that race again in her career, Mani Bhavan never developed, and Appealing Zophie did not run back to this effort in her career. The last horse to go on to do anything of consequence from this race was Ashado back in 2003 who went on win the Kentucky Oaks among her other accomplishments. The Hopeful has a better record of turning out future stars in the sport. Silver Wagon won this race in 2003 and went on to win a few stakes races, Birdstone also ran in this race and he ended up winning the Belmont and Travers. Afleet Alex was champion three year old the following year after capturing the Arkansas Derby, Preakness, and Belmont. Vineyard Haven won this race two years ago and had a solid abbreviated campaign with a win in a grade one sprint at Laurel and placings in the King's Bishop and the Cigar Mile Handicap. The headline of the day was Lisa's Booby Trap and her attempt to navigate the turf surface for the first time, Daily Racing Form did a great job of covering this race with three pages worth of write up on it. As for today's program, outside of race three where I am leaning towards putting some coin on Don't Forget Gil it looks like a day to use a dart board as a handicapping tool. Race two started off the flats for the day and Wascally Wabbit is no longer a maiden, he took over at the half mile pole and held off Camillus Drive to win by three quarters of a length. The time on the race didn't come back to good though running a pedestrian 1:12.51. It will be interesting to see if there is a claiming race they can run this one back in or if they have to move up to allowance conditions. Awesome Maria made a triumphant return to the races as the 7/5 favorite in the first division of the Riskaverse stakes. Awesome Maria was stakes placed against top filly Devil May Care last year on dirt and the ability she showed on turf certainly opens up many future spots that this horse can run in. The other division of the Riskaverse featured Lisa's Booby Trap, after defeating rivals in her first four races by over 40 lengths she was entered on turf. In hindsight this was probably a bad decision, but it is nice to see the connections of a horse take a risk and see what their horse can do. Much to my surprise there was a wire to wire winner in this race, on paper it looked like a race loaded with speed. Queen of the Creek proved me and a good percentage of the public wrong as she was never touched on the front end with her smallest margin in front being three lengths. Weekend preview will be posted later in the day and possibly another photo essay/recap from today's events at Saratoga. Muhaawara is going to dominate here on the front end. She will assume the role of alpha mare and cruise to a win while loose on the lead. She is a true lone speed on the inner turf.